Matt Maher, the popular contemporary Christian music artist, has a new album titled “The Advent of Christmas.” I was struck by the lyrics from one of the featured songs, “Hope for Everyone,” because I think it captures the essence of this holy time. Advent and Christmas are seasons of hope. Much of society would like us to believe that these first few weeks of December are all about decorating our houses, scheduling parties and shopping for presents to put under the tree. There’s nothing wrong with these activities, of course, as long as they don’t get in the way of what we really need to be doing during the Advent season: anticipating and getting ready for the coming of Christ into our world and into our hearts. This is what we truly hope for. The promise of Emmanuel — “God with us” — is fulfilled with Jesus — whose birth was announced to lowly shepherds and who was wrapped in swaddling clothes and placed in a manger, a feeding trough for animals, as his first crib. 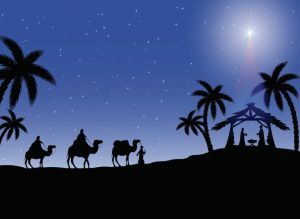 These are not the heavenly circumstances into which many would expect our Savior to be born. But I think it says a lot about the hope that Christ brings. Christ came for everyone. This includes the lowly, the poor, the broken, the outcasts and the sinners. Jesus showed his affinity for people on the peripheries of society through his ministry and teachings. Some of the most powerful passages of the Gospel focus on this: the parables of the Good Samaritan and Prodigal Son, and his preaching that “whatever you did for one of these least brothers of mine, you did for me,” just to name a few. Jesus is the One who lights the darkness for everyone in our world. He came to us at Christmas, he died for our sins, and he will come to us again at the end of time. He comes because he loves us, and he asks us to welcome him into our lives, no matter what our situation is. And he asks us to be a light for others who may be facing darkness in their lives because of the death of a loved one, the loss of a job, bullying they experience at school, family discord, abuse, or any of a million other reasons. httpv://youtu.be/X-ThP8qEio4 The season of Advent isn’t very long, and I hope you’ve been able to slow down a bit, spend more time in prayer and redouble your efforts to help people in need. But even if you haven’t yet, it’s not too late! Spend extra time reading and reflecting on the Sunday Scriptures readings over the next few weeks, participate in the sacrament of reconciliation and look for volunteer opportunities available at your parish or in your community. I offer my blessing for the remainder of the Advent season, and my best wishes that you and your loved ones have a joyful and peaceful Christmas.